When I was a young child, people used to bake Apple Pie all the time. Many people would put the just baked pies onto an open window ledge to cool off and you could sniff the aroma when you got close. The fragrance of the still-warm dough was lovely, and the scent of the cinnamon and nutmeg spice was heavenly. I still can remember that wonderful bracing bouquet. I don’t know anyone who bakes pies anymore, except for those store-bought frozen prefabricated pies that all you do is put in a hot oven. I guess they are a reasonable substitute, but people like me would want to duplicate that pie at home from scratch. When I think of all the modern advances (convection and microwave ovens, food processors, pressure cookers, slow cookers etc. etc.) now available to everyone, it’s hard to understand why people eschew cooking so often. But I know that times change and peoples’ interests do too. When my mom did the laundry on Mondays it took all morning. When the wash cycle was complete, she would put all the laundry through rollers at the top of the tub. These originally were hand cranked, but my mom’s was electric. She still had to boil the water on the stove first for the wash, then after wringing could use cool water for the rinse and then run them through the wringer again, and then put them on a pulley wash-line with wooden clothespins to dry. The point being, with all that activity, and before permanent press, a lot of ironing, she still prepared meals from scratch, including occasional cakes and pies. Talking with a French immigrant a while back, he said his mom didn’t have it as easy as mine. His mom used a washboard and unheated creek water, and the toil was endured because all the other women in the area worked together and exchanged talk, not having any other way to launder at that time. But he agreed that apple pie was a favourite at his house too, although different than my mom’s. Apple pies always have two crusts, use fragrant spices, and employ lard or vegetable shortening in the dough. The typical French apple pie is called Tarte aux pommes, has only a bottom crust and is made with butter. Personally, I like both pies, each a variation of the other. 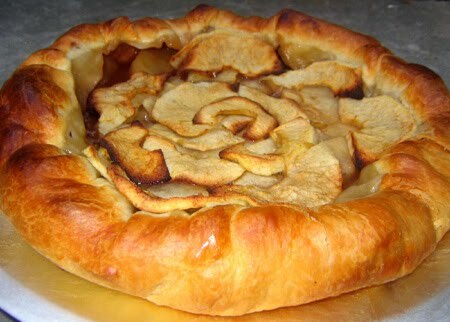 When I first made a French apple pie it didn’t come out perfect. There is a certain technique to making the dough, assembling the tart and all, but it is not difficult. The first Tarte aux pommes I made tasted fine; the second one did too, but also looked perfect. Please try the French apple pie, your guests will appreciate your effort and once you achieve success with the tart concept, there are a lot of tarts you can make, including a savory quiche. 6 ounces (1.5 sticks) unsalted butter, cold, cut into small dice (1/4”). You should put the diced butter in your freezer to keep it cold. 1. Place the first four ingredients in a large bowl. Mix the ingredients so that all the butter dice are coated with flour, as if making a biscuit dough. You can use a biscuit dough blender, two dinner knives or your own hands. 2. Pour most of the water in and start kneading the ingredients to gather into a ball. You may or may not need the entire 1/3-cup of water. It should not be “wet”. You should see tiny pieces of bare butter throughout the dough and this is good because it will ultimately produce a desired flakiness. You don’t want to over-work the dough, for that would make it too elastic. If so, let rest in the refrigerator for about one hour. A simple kneading will make it malleable and able to be shaped without breaking. 4. Roll the dough onto the rolling pin. 5. Lift it up carefully and unroll onto a flan ring, mold or pie plate. 6. Using your fingertips, push dough into the sides. You don’t want to stretch the dough, which could make it shrink while it is baking. 7. With your thumb and forefinger, squeeze a lip gently all around the inside of the of the ridge. 8. Use a knife and rolling pin on top of the ring to trim the dough. Remove and freeze for later or discard. 9. Crimp the edge so it looks good, using once again your finger and thumb. You can also mark the edges with the tines of a fork for a nice appearance. If you don’t have a flan ring or removable bottom mold or pie plate, you could make it on a cookie sheet and roll up the edges to hold in the filling. 2. Have your dough ready. Get 5 apples such as golden delicious or granny smith and trim both ends by carving out with the tip of a paring knife. Peel the apples. 3. Cut each apple in half, and then cut out seeded area. 4. Cut into ¼” slices. Chop the end slices coarsely, and set aside the lovely uniform center slices. 5. Place the chopped apples on the pie shell bottom. 6. Arrange the center slices atop the chopped apples at the rim going inward. 7. For the pie center, arrange the apple slices almost vertically so they look almost like a flower. 8. Now sprinkle evenly 3 tablespoons of sugar and 2 tablespoons butter, cut into small pieces, on top of the apples. 9. Bake the tart about 75 minutes. Check it from time to time; the tart should be well browned with a beautiful golden crust. Remove the flan ring if used. If a cookie sheet was used, use a metal spatula and remove the tart. 10. You may apply a glaze to the tart using apricot or apple jam if you like. Strain the jam through a sieve and dilute with brandy or water. 11. Do not refrigerate the tart, it is best kept and served at room temperature. You can get eight servings of this delightful tart, depending how you slice it. Please try it, because no matter how you slice it, it’s a wonderful dessert. Thank you so much for dropping by my blog and leaving your heartfelt comment. I made pie--fresh peach pie--a while back. As I set in on the counter, I wished I could place it on the windowsill. I had a epiphany: Aha! That's why people used open windows to cool pies down--it was the fasted, most effective way! I think it would be nice to go back to those good ole days. Well, we know they had their problems, too, but life was not as hecticly chaotic as it is now. I think about the Amish people and marvel at them. Do they suffer all the disorders we do? (ADHD, Anxiety, Bi-Polar, etc) And what about their health conditions? Are they as susceptible to cancer as we are because we expose ourselves to processed foods and microwaves? Thank you for sharing the wonderful recipes! I will add them to my collection and try them. The Education Tipster and myself appreciate your comments. I used to visit an aunt in Maryland and a couple of times we went to Lancaster, Pa where I first encountered the Amish. I still have one of their cookbooks. They ate heartily, used lard very liberally yet were considered healthier than the genl. population. Thank you for jogging my memories. What a great photo. I can almost taste the tarte. Reminds me of my student days in Paris back in the mid-60s. And I've gotta say, anyone who mentions grits and groceries in the same sentence has got to be from the south. With parents from Florida and Mississippi, I'm not a stranger to grits and red-eye gravy. Thanks for your comments Bill. I saw a movie in the early '60s called: "Paris Blues" about two Americans who meet two Parisians there. I think Sidney Poitier starred in it. The exterior scenery was very beautiful, and people on bicycles in the morning carrying naked loaves of bread was quaint. I love grits and red-eye gravy with eggs and ham, but was actually born in Brooklyn, N.Y. and raised on Long Island. But I always loved that 50s rock 'n roll song by Little Willie John--"Grits and Groceries". The other favourite by him is "Cottage for Sale" So I call my blog by the former title. That delicious apple pie. My wife also prepares very good. Greetings.